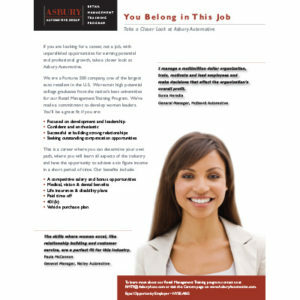 Recruiting and Retention – Insight Strategic Communications, Inc.
Asbury Automotive Group, one of the nation’s largest auto retailers, has an excellent Retail Management Training Program that puts qualified individuals in the driver’s seat for a career in the automotive industry. They wanted to create more awareness for this program and to show potential candidates the range of opportunities available with this leading company. We worked with Asbury Auto’s in-house experts to create pop-up displays for the dealerships and created advertising and recruiting outreach, both digital and print. What started as a small project grew to a multi-audience campaign, with targeted recruitment materials for interns, new college graduates, females and military veterans.